I got another update from the Argon Express this morning during a stop in St. Paul Minnesota. Here are some of Robby’s thoughts from the train. We just left the Amtrak station in St. Paul, Minnesota and we can now see the Mississippi to the right of the train. Sleeping on the train has been one of the biggest challenges and Josh and Alain snuck into sleeper cars last night. People have been commenting how they haven’t seen so many laptops on a train before. We’ve had good luck with the power and have power strips running in two areas of the train so nobody has run out of battery life. We’re going to try and post more pictures to the groups in the next day as we have more internet access. Robby did seem to find a moment to post some more photos. Be sure to keep checking the PLANET ARGON Argon Express photoset for more updates. Chris Anderson is working on a version of Asset Compiler for audio files with the help of Jeremy Voorhis. Sitting in my seat on the Argon Express and been looking out the window for most of the day. Brian is reading my latest copy of Scientific American Mind and I’ve been reading, Wherever you go there you are. Jeremy Voorhis is reading the Betrand Russell book I brought and is in front of us and Jeremy Hubert just took his shoes off and is watching The Pink Panther. Josh Knowles got the internet up for a few minutes… long enough for me to see the last post by Allison. I predict we’ll have very limited internet for the rest of the day, which is just fine with me. The train is quite relaxing and we stayed up really late last night, which took its toll on my energy level for the day. Sleeping on a train is not as easy as one would think. 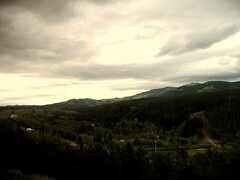 Woke up this morning to some awesome scenery in western Montana, which I will try to upload in the near future. As far as development projects, Chris Anderson and Jeremy Voorhis stayed up pretty late working on a variation of asset compiler for audio files… should be interesting to hear about that. Welcome to our fair state of Minnesota. I considered joining the Express here, but I didn’t want to take another day off work. Bummer! Anyway, see you guys at RailsConf tomorrow!